I had always looked forward to climbing A’Chailleach and Sgurr Breac one day since they form a compact and attractive group of two Munros with steep-sided ridges jutting out to the north. So it was with anticipation in my heart that Frank and I started the hike at the parking on the A832 where the landrover track to Loch a’Bhraoin starts. From our last walk in this area when we climbed Sgurr nan Each we still had the recollection of a very soggy path which leads from the ruin on the lochside to the bridge over the outflow of Loch a’Bhraoin. However, this had been replaced by a well engineered path through the pine plantation and in no time we had crossed the bridge over the Abhainn Cuileig and started the climb of the steep north end of Druim Rèidh. Higher up the grass was dotted with boulders, outcrops and even some small trees in protected spots. Progress was made very nicely and soon we reached the much flatter part of the ridge at 550m. This was all very pleasant since the sun was shining and no rain was falling. We continued southwards and after a kilometre the ridge became more defined. Nice views of the crags of Sgurr Breac, the gentle, curving ridges from Tomain Coinich to both Munros and of Loch Toll an Lochain were the reward for our efforts. Snow covered the ground in many places once we crossed the 750m contour. Then the summit of Tomain Coinich was gained, we turned west and descended a few dozen metres to the beallach where the steepish ridge leading to A’Chailleach begins. From the beallach to the summit the whole ridge was covered in snow – frozen in some places, soft in others. At the summit cairn the wind was strong and it felt quite cold after a while. 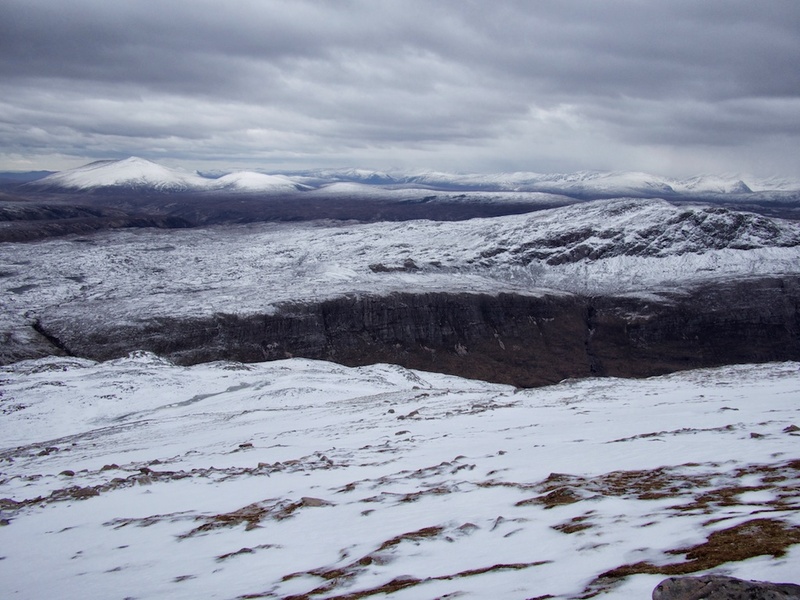 The views of Fisherfield and An Teallach were nice, though. Friday morning, 12 May 2006, having been a windy and wet affair we chose to climb this hill as a quick up-and-down-and-bag-it tour later that day. So, in the early afternoon we locked the car in front of Achnasheen’s railway station. After crossing the A832 we headed up the steep hillside beside the Allt Achadh na Sine to emerge on the flat boggy terrain strewn with peat hags which lies at the foot of the corrie formed by the slopes of Creagan nan Laogh and Fionn Bheinn. After having negotiated the peat and bog we soon climbed up the open southern side of Fionn Bheinn over easy but steepish grass. At the summit cairn we joined a group of English hillwalkers for whom Frank snapped a few photographs. Then we enjoyed the views. There is hardly any better viewpoint for the Great Wilderness, the Fannaichs, and perhaps for parts of the Torridon and Glen Carron hills too, than Fionn Bheinn. We were deeply impressed and played name-the-hill for quite a while. But then the cold wind got the better of us and we reluctantly headed back to Achnasheen by the way of ascent. What a pity that we had no camera with us on this walk! We should return to this hill on a crisp and clear winter day and snap photos like mad! On the left bank of the Abhainn we followed the bends of the burn which carried a lot (!) of water indeed. The going was good and the path was sort of dry. Soon we reached the confluence of the Allt an Loch Sgeirich and the Abhainn a’Ghiubhais Li, crossed the first and continued our tramp along the left bank of the latter. We did not (!) use the bridge but climbed further on the deteriorating path. Higher up the burn we managed to cross it and headed over heathery terrain up the gentle slopes of Meallan Bhuide. Well, close to the rounded summit of this hillock the rain caught us and ended the short intermezzo of two hours walking without water coming down (my feet were soaked anyway, so hey, what difference does it make?). Loch Gorm came into view. It nestled nicely between the crags of Meall Gorm and the corrie headwall which lay ahead. We climbed into the hanging corrie above the loch, veered in a south easterly direction and came to the summit slopes of An Coileachan. At the summit sleet was coming down so the short rest was rather uncomfortable. From this first Munro we turned north-west, crossed the area at the head of the corrie of ascent and climbed the grassy slopes, interspersed with rocks, which lead to the very flat ridge of Meall Gorm. The wind now caught us, things became considerably colder and the visibility dropped to 50 meters. 2009 May 2009 was the wettest hiking season in Scotland that I ever had the privilege of experiencing. This tour proved to be no different from the average squishy, slithering, sleety, soaking standard. Having set our mind on ticking off the four eastern Munros of the Fannaichs we approached the hills from the parking on the A835 between Loch Droma and Loch Glascarnoch which is at the bridge over the Abhainn an Torrain Duibh. Start of tour at parking on A 832 close to private road to Loch a’ Bhraoin. Up the glen of the Allt Breabaig to the head of that glen. Ascent east to the Cadha na Guite. Wind and snow increasingly strong. Views of Sgurr nan Clach Geala, Sgurr Mor, the Western two Munros of the Fannichs and An Tellach. Further to the summit of Sgurr nan Each. Drifting snow hurting the eyes. Return by way of ascent. Beautiful glen with good path on both sides of the Allt Breabaig. Relaxing if somewhat long approach to this part of the Fannichs.